I’ve been trying to get baby girl used to sleeping in her crib. We’re reluctant co-sleepers* but it’s not been terribly stressful in the summer. We hardly keep any blankets on the bed. All the same, I pray to Brighid for protection each night. (To be fair, I would do that no matter what!) I would like to have her sleeping mostly in her crib by winter and, so far, the baby steps we’re taking have started to bear fruit. I’m able to have her sleep there for longer periods. 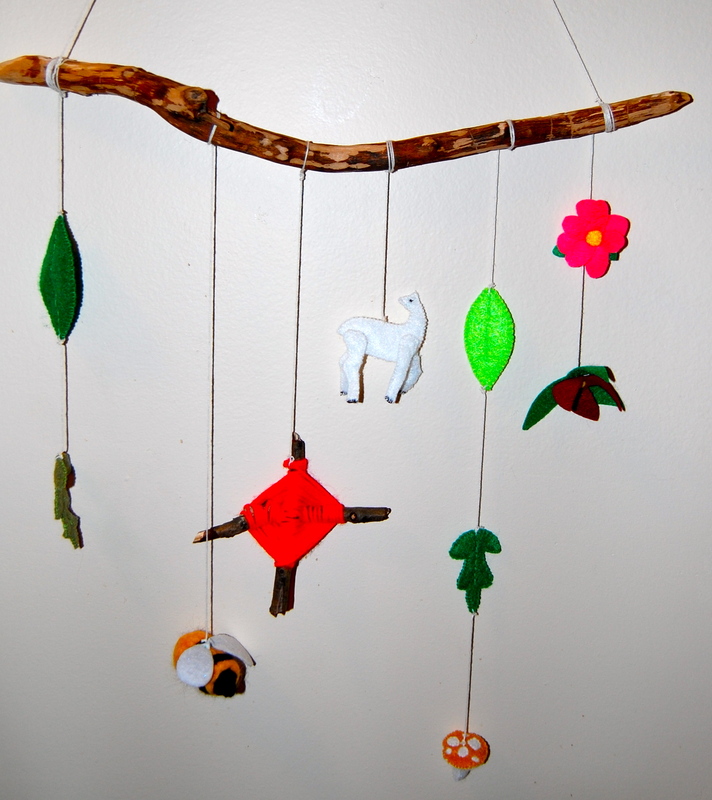 As Bee has grown, and her sense of sight has improved, she’s able to see the mobile I made for her. Early this morning, just as the sun was peeking over the horizon, I moved her to her crib to see if I could get a few hours of sleep in a more comfortable, less guarded position. She was sleepy acting but also awake. Bee spent a long time just starting up at the mobile, babbling at it. I saw her grin a few times, too. It made me feel really good that she finds the mobile interesting and enjoyable. When I made it, part of its purpose was for protection and nature awareness – but I also wanted her to like it. Now that I see she does, it makes me feel amazing. Those simple, gummy grins have been the most fulfilling compliments I’ve ever received as an artisan. Reaction to “Is it Ethical to Use Silver in Druidic Rites” and Where to Go Next? When I first asked my readers, “Is it Ethical to Use Silver in Druidic Rites?” I was bracing myself for some tongue lashings. I felt the same way sharing my concerns on the ADF Discussion list. Although I did get responses along the same tone I’m used to when explaining my vegetarianism, many people – more than I originally thought – were very supportive. Many, to my delight, feel the same way and have been working through similar issues! As I explained yesterday, while not dogma in ADF, the use of silver has quite the tradition. Coming out and expressing discomfort with a tradition in a group as established as ADF can be very uncomfortable… but I’m so pleased to know I’m not alone. Even within the larger Pagan community, there are others who recognize the environmental hazards related to mining – whether for silver, other precious metals, or even the gems everyone in the Pagan scene is so gaga over! Regardless of whether you continue to use mined resources in your magical workings, it should be important to you to learn where your tools and materials are coming from. When you walk on an Earth-Centered path, your impact should be of concern. Personally, I want to walk in balance. I am not perfect – would never claim to be. The majority of my food is organic and/or local; I grow some of my own food and many of my own herbs; I compost; and I use reusable shopping bags. But I still drive a gas-powered car. I rent and can’t convert my apartment to a solar-powered, grey-water using haven. I take control of what I’m able to, and putting a halt to my personal use of mined products seems like a pretty good thing to do. It’s easy. It’s good for Mama Earth. Traditions sometimes have to change in light of environmental impact or societal change. I leave this behind with the head hunting, the human sacrifice, and the exclusion of men from keeping Brighid’s flame. Precious metals and gems have real potential in the form of talismans, I think. One of the arguments with regards to the ethics of silver is recycling it. By continually offering it, we take it out of the system of reuse and recycling thus requiring more to be extracted. Some people have commented saying that they like the idea of using a silver piece as a magical talisman to consecrate the water. Through ritual reuse, the talisman will grow in power. There is a large silver triskel pendant on my altar. I felt compelled to buy it while vacationing in Ottawa. At the time I didn’t know why other than the Kindreds seemed to want it – but they wanted it on my altar. Now I’m wondering if I could use it for consecration purposes. The silver is already in my possession, albeit claimed by the Kindreds for use on my altar. I would be reusing it ritually, it would become a spiritual heirloom, and it wouldn’t be removed from the system of reuse and recycle. Others have commented that this possibility intrigues them and they are also thinking of trying it. A silver pendant I felt called to bring home. It’s been waiting on my altar and is a bit tarnished now. Time for my favorite silver cleaning ingredient – toothpaste! Others are also comfortable using quartz. Several said they already use them or locally found stones. It is interesting that the idea of silvering the well is not universal throughout Indo-European practice. Author Nimue Brown commented that she only leaves biodegradable offerings and prefers the option of cleaning up a location. In my post yesterday, I suggested the possibility of a grove pledging to clean a beach or river area prior to a ritual. The more I think about that possibility, the more I find it attractive. It could easily be combined with simply using other sacred waters to consecrate a well. Perhaps after the cleaning, a small vial of water would be taken then placed in the well vessel. There are clearly so many possibilities when working with water and consecrating the well. It is important to respect and learn from tradition, but I would argue it’s more important to update and adapt our traditions to live in better harmony with the world. It’s also equally important to get involved with organizations to protect sacred places, end devastating environmental practices, and lobby politicians for ethical, rather than purely financial, ends. Perhaps this isn’t the right fist step for you. Perhaps there are other aspects of your spiritual life that you could change for the sake of the Earth Mother and Nature Spirits you so love. Evaluate your practice and make changes there first. As a people who so revere Nature, it only seems right that our “greenest” practices are within our spiritual rites. Through those changes, all others should follow. While she is not a Druid, I want to leave you with a quote from Starhawk. * Fawn Russell. “[ADF Discuss] Silver Offerings.” ADF Discussion List, 29 Aug, 2012. Web. 29 Aug, 2012. **Drum. “[ADF Discuss] Silver Offerings.” ADF Discussion List, 29 Aug, 2012. Web. 29 Aug, 2012. ***Starhawk. The Earth Path: Grounding Your Spirit in the Rhythms of Nature. New York: Harper Collins, 2004. Print. Keep the witches from their speed. Rowan is a very magical tree that has been connected to Brighid and Imbolc. The fiery red berries that ripen in the autumn remind one of her sacred flame. Country folk would make crosses with the branches and red thread, then attach them to their cows’ tails as a protective charm (Freeman, p. 264), which further connects them to Brighid in her role as a patron of domestic animals, particularly livestock. The Witch of Forest Grove recently posted an inspirational entry on her blog about rowan – “Rowan, Red Thread, and Feathers.” She describes the Scottish tradition which is very similar to other Irish customs of using rowan as a protective charm in the house. Alchemy Works has an equally interesting description of rowan – the magical, culinary, cultural, and medicinal applications. Check out Edible Wild Plants A North American Field Guide by Thomas S. Elias & Peter A. Dykeman for some more recipes. 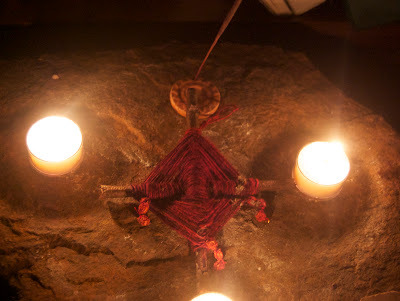 Inspired by The Witch of Forest Grove, the full moon, and my excitement over Imbolc’s approach, I decided to make my own protective rowan cross with strings of dried rowan berries attached. I consecrated it in Brighid’s name during a ritual tonight and hung it in my bedroom. The ogham I drew following the rite were very good. I interpreted them to mean that Brighid had definitely joined me and that the charm was full of protective energy. If you’re looking for something new to try to celebrate Imbolc, I definitely suggest making a rowan cross. Freeman, Mara. Kindling the Celtic Spirit. Harper Collins, 2001. 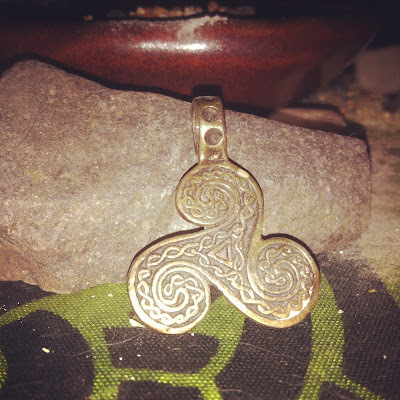 I want to share the prayer I say when I put on my protective talisman – my triquetra necklace. It was a gift from my husband and is very, very special to me. It’s always been like a talisman to me, so enhancing that power through ritual only seemed natural. I say this prayer every morning when I put it on. On the rare occasions that I wear a different necklace, I usually hold the triquetra and say the prayer anyway. I thank the Kindreds for their guidance, protection, teachings, and inspiration. And may I bring honor to them in all I say and do. The prayer has evolved over the years, but the essence is still the same.